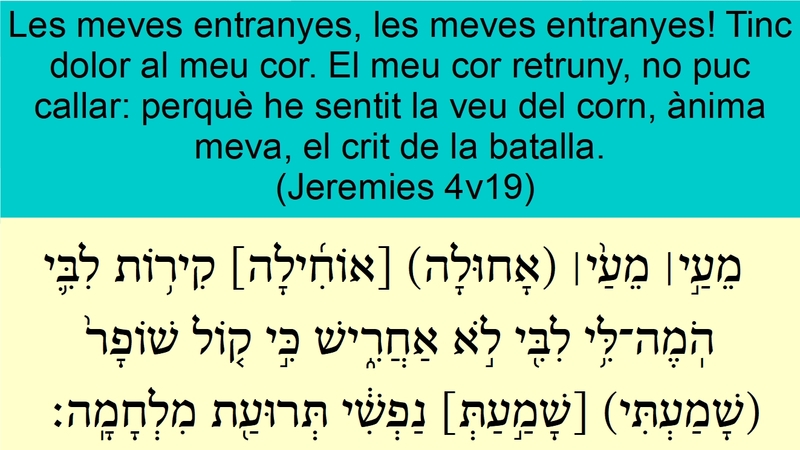 Jeremies 4v19 Les meves entranyes, les meves entranyes! Tinc dolor al meu cor. El meu cor retruny, no puc callar: perquè he sentit la veu del corn, ànima meva, el crit de la batalla.מֵעַ֣י׀ מֵעַ֙י׀ (אָחוּלָה) [אוֹחִ֜ילָה] קִיר֥וֹת לִבִּ֛י הֹֽמֶה־לִּ֥י לִבִּ֖י לֹ֣א אַחֲרִ֑ישׁ כִּ֣י ק֤וֹל שׁוֹפָר֙ (שָׁמַעְתִּי) [שָׁמַ֣עַתְּ] נַפְשִׁ֔י תְּרוּעַ֖ת מִלְחָמָֽה׃ My bowels <04578>, my bowels <04578>! I am pained <02342> (08799) (08675) <03176> (08686) at my very <07023> heart <03820>; my heart <03820> maketh a noise <01993> (08802) in me; I cannot hold my peace <02790> (08686), because thou hast heard <08085> (08804), O my soul <05315>, the sound <06963> of the trumpet <07782>, the alarm <08643> of war <04421>.